1pm: Join exhibition curators and artists Rodrigo Valenzuela, Dan Attoe and Lavar Munroe for a walking tour of the English Camp. 3pm: Walk to Westcott Bay Shellfish Co., neighboring the San Juan Island National Historical Park for fresh shellfish and refreshments in a waterside picnic setting. The scenic island venue is accessible by ferry from Seattle and Anacortes; or by seaplane from Seattle’s Lake Union or Boeing Field for daily or weekend excursions. 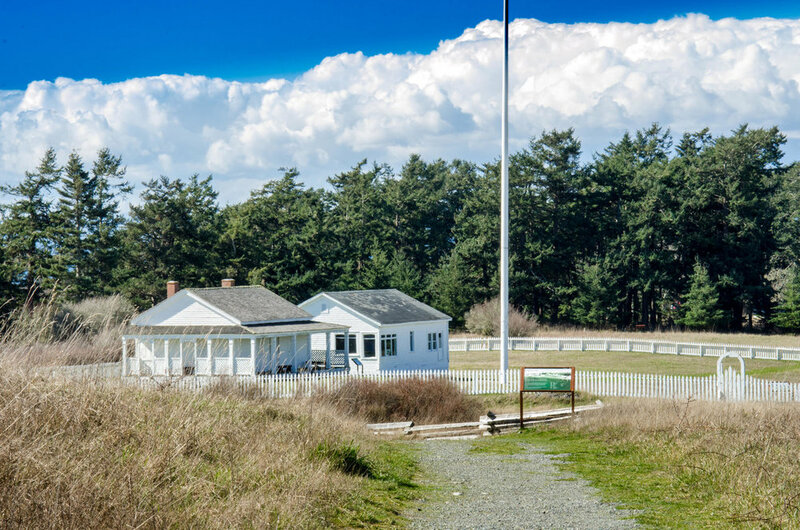 The historic Royal Marine Barracks (dating from 1860) provides the first venue visitors will experience upon entering San Juan Island National Historical Park. Featuring moving image works from R.H. Quaytman and Adrian Piper, the venue will further showcase installations by Brian Jungen and Pope.L in dialogue with painting, print and textile works from Dan Attoe, Matthew Brannon, Jasper Johns, and Marie Watt, and newly commissioned work from Dori Hana Scherer, Lavar Munroe, and Rodrigo Valenzuela. 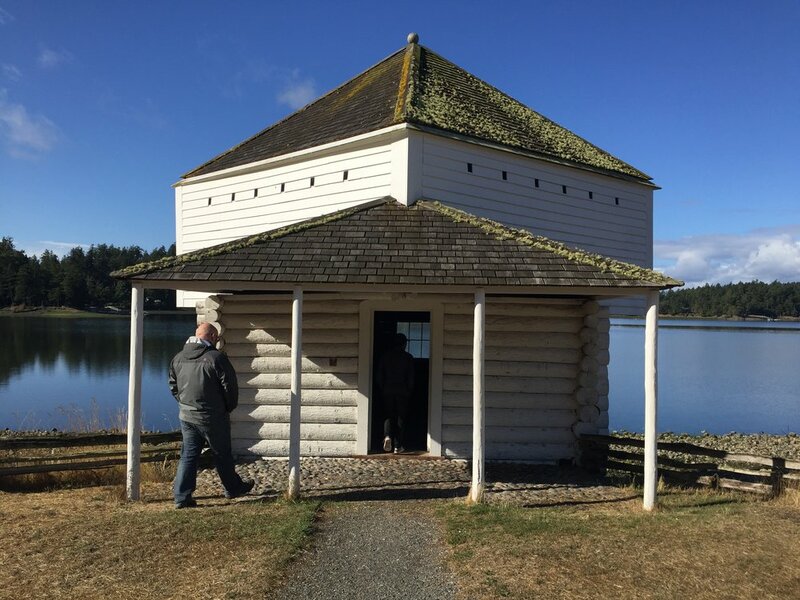 Perched at the edge of Garrison Bay, the rotunda-like blockhouse will feature an immersive sound installation by composer and interdisciplinary artist Eyvind Kang, including an additional collaboration between Kang and vocalist Jessika Kenney, with poet Anne Carson and her frequent collaborator Robert Currie. 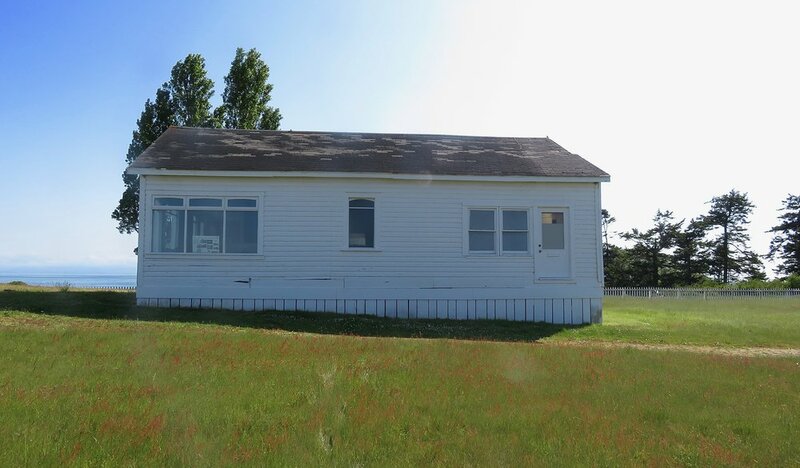 The first structure erected in English Camp for unloading cargo, the encampment’s storehouse will be the site for work from Paul Stephen Benjmain, sculptural works by Duane Linklater and Lavar Munroe and textile work by Anna Von Mertens. Existing in its original condition when it was last used as a clinic for British soldiers, the hospital will house newly commissioned installations by sculptor Jeffry Mitchell and poet and visual artist Aram Saroyan. Dan Attoe, Korakrit Arunanondchai, Paul Stephen Benjamin, Matthew Brannon, Cat Clifford, Jasper Johns, Brian Jungen, Eyvind Kang, Duane Linklater, Jeffry Mitchell, Lavar Munroe, Jenny Perlin, Pope. L, Adrian Piper, R.H. Quaytman, Aram Saroyan, Dori Scherer, Barbara Earl Thomas, Rodrigo Valenzuela, Anna Von Martens and Marie Watt. See our VISIT page for more information on how to get to the National Park, and the NPS website for seasonal hours and updates. Drawing from the National Park’s archive of primary source materials, interviews, ecological and geological research, familial and personal narrative, the artists at American Camp present moving image, sound, text based work, and events that explore migration, ecology, and the messiness of becoming American. While not a formal collaboration per say, the artists share gathered materials passing on that which they find important to the others' inquiry — be it a poetic geological term, a family story, or an invite to a butterfly release. Artists at the American Camp include: Gretchen Frances Bennett, Cat Clifford, Lynne McCabe, Ruth Robbins, Barbara Earl Thomas. *extend the party and celebrate Dylan Neuwirth’s exhibition opening at Oxbow ! Extending the exhibition to the urban context of Seattle’s burgeoning Georgetown arts district, studio e will host a group exhibition that brings together additional works from participating artists and acts as a call and response to the site-specific experience of Becoming American at San Juan Island National Historical Park. 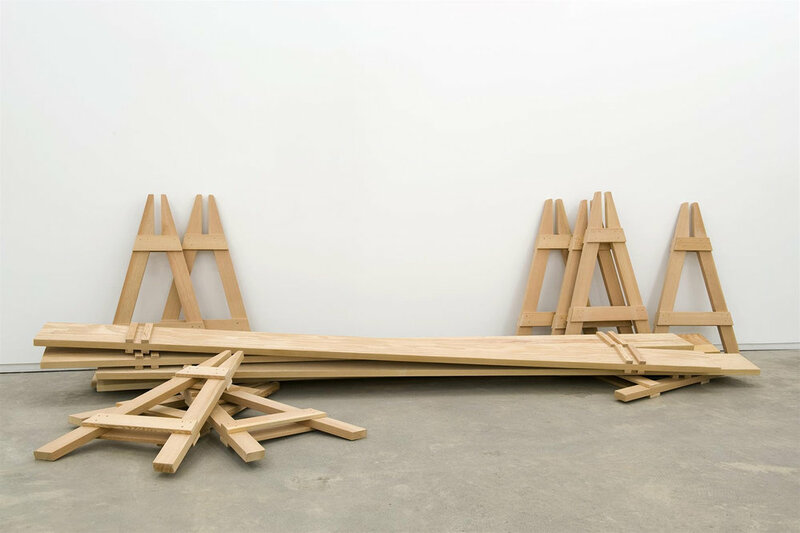 Brian Jungen, Barricades, 2010 Fir, 5 parts, each 41 x 26 x 144 inches (104 x 66 x 366 cm). Courtesy Catriona Jeffries Gallery. Pope. L, Wordy Advertisement, 1983-2013, Acrylic, ballpoint, cellophane tape, collage, graphite, ink, marker, oil stick and vinyl letters on found cardboard advertisement with pushpins in artist’s frame, 36 1/4 x 24 1/2 in. © Pope.L. Courtesy of the artist and Mitchell-Innes & Nash, NY. Jenny Perlin, Twilight Arc, 2016, 16mm film transferred to digital, color (Desmet tinted), silent, 12:10. Courtesy of the artist and Simon Preston Gallery, New York. Every thursday, friday & saturday 1-6pm* Open late the second saturday of each month from 6-9pm during Georgetown Art Attack or by appointment. 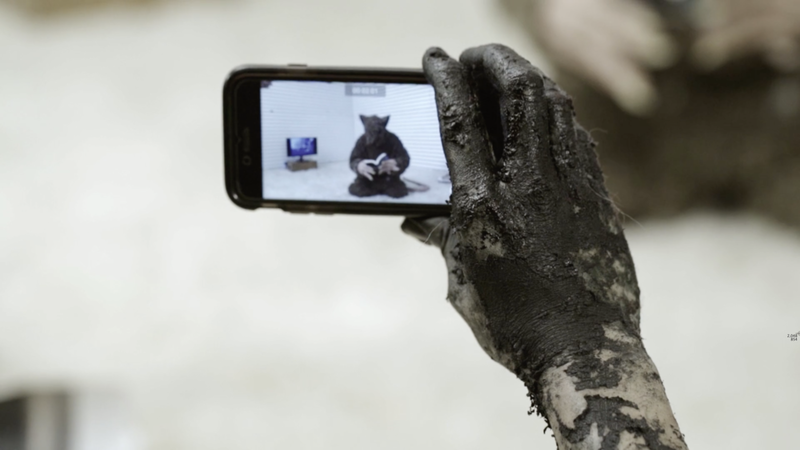 Specialist, an artist-run gallery in Seattle’s Pioneer Square, will host an immersive installation from Korakrit Arunanondchai, including a new iteration of his recent video installation With history in a room filled with people with funny names 4. Bangkok-raised, New York-based artist Korakrit Arunanondchai engages a myriad range of subjects from history, authenticity, and self-representation to cultural tourism, transhumanism, political unrest, and the uneasy place of spirituality in a globalized world. Through a lens of a cultural translation and medium hybridity that is both earnest and skilled at parody, Arunanondchai’s immersive installations and videos mine the tensions between technology and animism, painting, a fractured cinematic space, and religion and popular culture, to create a contemporary mythology entirely his own. Featured within the exhibition Becoming American are new paintings and a solo presentation of Arunanondchai’s video With history in a room filled with people with funny names 4 (2017). The most recent work from an ongoing cycle titled Painting with History in a Room Filled With People with Funny Names, the video’s narrative follows a recurring surrogate character for the artist himself, a Thai denim painter, who plays up and off projections of otherness and difference here. A Chris Marker-like voiceover queries philosophical and poetic observations and is put into dialog with the responses of a drone presence named Chantri, who answers in a soothing sage female French voice inflected with a Thai accent. Existential questions like “who forms the design of death?” and “will you find beauty in this sea of data?”, reinforced by their subtitles, give way to more prosaic inquiries, including “how was your life during the Vietnam war?” or “how was Iran during the revolution?,” intimating that Chantri is perhaps an all-knowing seer of history capable of responding to the chaotic portrait of our current climate, captured and dramatized in the work via a mix of fantastical scenes and documentary-style footage. Scenes of protest in the United States shot over the past two years appear throughout as if in slow motion and on constant repeat, tracing an incredulity in the face of a new fragility that seems to permeate and haunt everyday American life since the 2016 election. Offset with clips from the massive public funerary rites of King Bhumibol Adulyadej of Thailand, including his cremation, one year following his death at the age of 88 in late October 2016, the artist stitches together what might appear to be far-flung civic moments in order to put them in relief as indicative of an uneasy surreal that is increasingly pervasive worldwide. 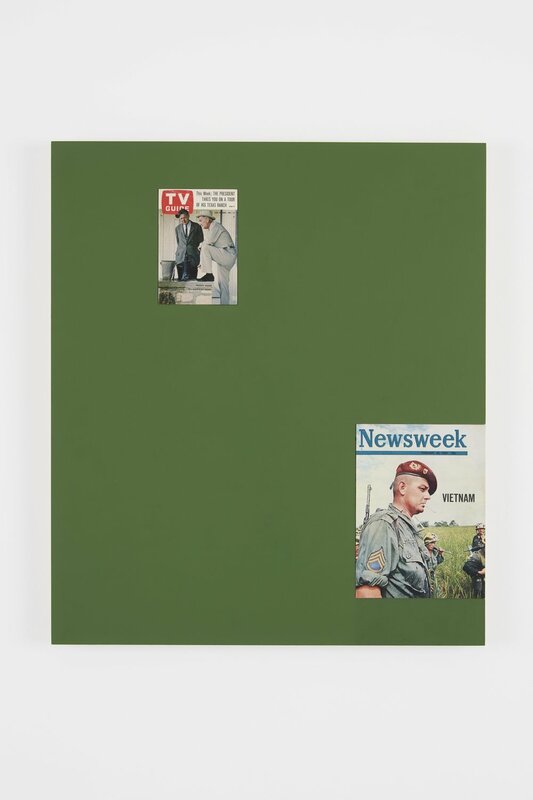 Public mourning and the framing of authoritarian fallout interweave as major events in the United States and Thailand share a collaged proximity in Arunandonchai’s portrayal of rupture and irrevocable change. With Chantri’s cautioning yet oracular responses offering an elegiac yet calming tone, a hypnotic backdrop unfolds as performative scenes show a non-gendered futuristic species of green humans taking form as well as tragicomic interactions between a dystopic race of humanoid rats and awestruck humans, as if both visions await us. Declarations of a coming hybridity seem to promise a future in Arunandonchai’s work where “there will be no music in this room only scars left on the face of the planet,” as Chantri intones, and a “new species will rise from underneath these scars with fresh wounds.” Intermixed with a quiet breathing throughout that is equal parts anxious and meditative, the work forces uneasy cultural comparisons throughout as a pristine aerial shot of Thailand’s largest Buddhist temple, Dhammakaya Wat, home to the fastest growing and controversial Thai Buddhist movement (often compared to Scientology), is contrasted with the downtrodden yet ostentatious excess of the Trump Tower in Midtown Manhattan as a crowd of protestors gather. Against the omnipresence of instant mediation, self-broadcast, and expanded network control that late capitalism touts as our inevitable reward, Arunandonchai morphs transhumanist promise into a schism-laden vision of what’s to come, the twofold hope of a new syncretism alongside a corrosive vision of constant crisis. Korakrit Arunanondchai (b. 1986) earned his BFA from the Rhode Island School of Design in 2009 and his MFA from Columbia University in 2012 and attended the Skowhegan School of Painting and Sculpture in 2012. He has had several solo exhibitions at CLEARING gallery in New York and Brussels and has been featured in major group exhibitions at the Sculpture Center and the Fisher Landau Center as well as a solo exhibitions at MoMA PS1, S.M.A.K, Ghent, Palais de Tokyo, Paris, the Johnson Museum of Art, Cornell University, and at J1 in Marseille, France. His work belongs to the collections of The Whitney Museum of American Art, New York, USA; SMAK, Ghent, BE; Museion, Bolzano, IT; Fondation Louis Vuitton, Paris, FR; K11, Hong Kong/Shanghai/Beijing, CN; Fondazione Sandretto Re Rebaudengo, Turin, IT; Aishti Foundation, Beirut, LB; and the Rubell Family Collection, Miami, USA, among others. Korakrit Arunanondchai, With history in a room filled with people with funny names 4, (still) 2017. video, 23:21 minutes . Courtesy of the artist and Clearing Gallery New York. Taking up a call and response exhibition format, Louder in the Dark features works from SOIL members that explore themes from the concurrent group exhibition, Becoming American, while also including a particular emphasis upon participating artist and poet Aram Saroyan’s groundbreaking “minimal” poetry. With a selection of poems punctuating the wall space of the gallery, Saroyan's work offers a frame to think through the larger exhibition and the complexity of our contemporary moment. Excerpted from a series of compositions written during 1964-72, a tumultuous yet highly experimental period in American art, culture, and politics, the poems compress text into acts of visual concision, rupture, revision, lyrical seduction, refusal, meditation, laughter, and cracked open innovation that are just as fresh and provocative fifty years later. Meant to be looked at as much as read, the poems are displaced and transposed from the page to take the conventional place of the image in the exhibition while artists’ works across medium will occupy the place of prototype, sketch, and model often associated with thinking through an idea or first draft. Assembled as a collective presentation of singular responses, a series of display tables sequenced within the gallery will present works that question, answer, and redirect what’s on view in the larger exhibition, including the poems that echo across the gallery walls. Aram Saroyan is a poet, novelist, memoirist, and playwright. He attended the University of Chicago, New York University, and Columbia University, but did not complete a degree. The son of the writer William Saroyan, Aram Saroyan made his debut as a writer with six poems and a review of Robert Creeley's novel The Island in the April 1964 issue of Poetry magazine. He became famous for his one-word or “minimal” poems, a form he developed during the early and mid-1960s, and which is often linked to Concrete poetry. Saroyan is also frequently linked to Second Generation New York School Poets and conceptual art. Saroyan’s first books in this mode were Aram Saroyan (1968) and Pages (1969). His poem consisting of the single word “lighght” was selected by Robert Duncan for inclusion in the American Literary Anthology and received an award from the then-new National Endowment for the Arts—for which it also received scorn and ridicule from conservative demagogues including Jesse Helms and Ronald Reagan. His visual arts practice, although under recognized for most of his career has recently been foregrounded in at the 2016 L.A. Biennial, which was subtitled after one of Saroyan’s poems, “a, the, though, only” and at Commonwealth & Co., Los Angeles (2016).